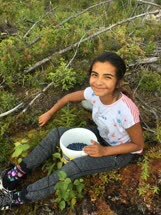 Avaqsaa Ulluliyarnat: All blueberries, went blueberry picking on a very beautiful calm day, near Naujaat, (Sirlua) 2017. 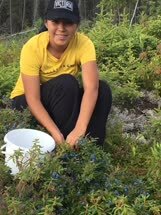 Blueberries that are not ripe yet are called nanuq in Inuktitut, which means polar bear. 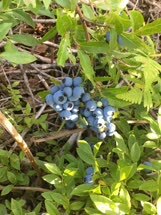 They are so called because unripe blueberries are white, just like the animal they are named after. 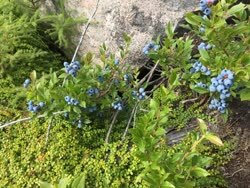 The Inuktitut word for blueberry is kigutangirnait, which means, �that which causes the teeth to be removed.� They were called this because they left little black pieces on the teeth (Ootova et al, 2001). 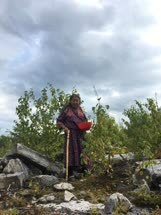 Both Dene and Inuit used the leaves of the bilberry plant in teas, and of course everybody loves to eat blueberries freshly picked off the plant. 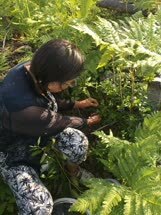 Inuit also preserved blueberries in seal oil or fat to be eaten later. 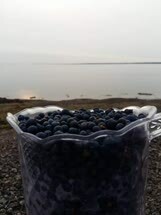 Blueberries, wild, frozen (Alaska Native) per 100 grams Proximates Water	g	88.70 Energy	kcal	44 Protein	g	0.70 Total lipid (fat)	g	0.00 Carbohydrate, by difference	g	10.40 Minerals Calcium, Ca	mg	15 Iron, Fe	mg	1.10 Vitamins Vitamin C, total ascorbic acid	mg	2.2 Thiamin	mg	0.030 Riboflavin	mg	0.100 Niacin	mg	0.400 Vitamin A, IU	IU	163 Blueberries, wild, raw (Alaska Native) a Proximates Water	g	85.48 Energy	kcal	61 Protein	g	1.22 Total lipid (fat)	g	0.76 Carbohydrate, by difference	g	12.31 Fiber, total dietary	g	2.6 Sugars, total	g	6.46 Minerals Calcium, Ca	mg	13 Iron, Fe	mg	0.37 Magnesium, Mg	mg	7 Phosphorus, P	mg	29 Potassium, K	mg	75 Sodium, Na	mg	6 Zinc, Zn	mg	0.20 Vitamins Vitamin C, total ascorbic acid	mg	18.3 Thiamin	mg	0.067 Riboflavin	mg	0.414 Niacin	mg	0.597 Vitamin B-6	mg	0.026 Folate, DFE	�g	33 Vitamin B-12	�g	0.00 Vitamin A, RAE	�g	6 Vitamin A, IU	IU	115 Vitamin E (alpha-tocopherol)	mg	1.69 Vitamin D (D2 + D3)	�g	0.0 Vitamin D	IU	0 Vitamin K (phylloquinone)	�g	17.2 Other Caffeine	mg	0 a The mineral and vitamin content of berries harvested in the wild and in specific regions of the country may differ from commercially produced berries.